Instant downloads of all 942 LitChart PDFs (including Me Before You). 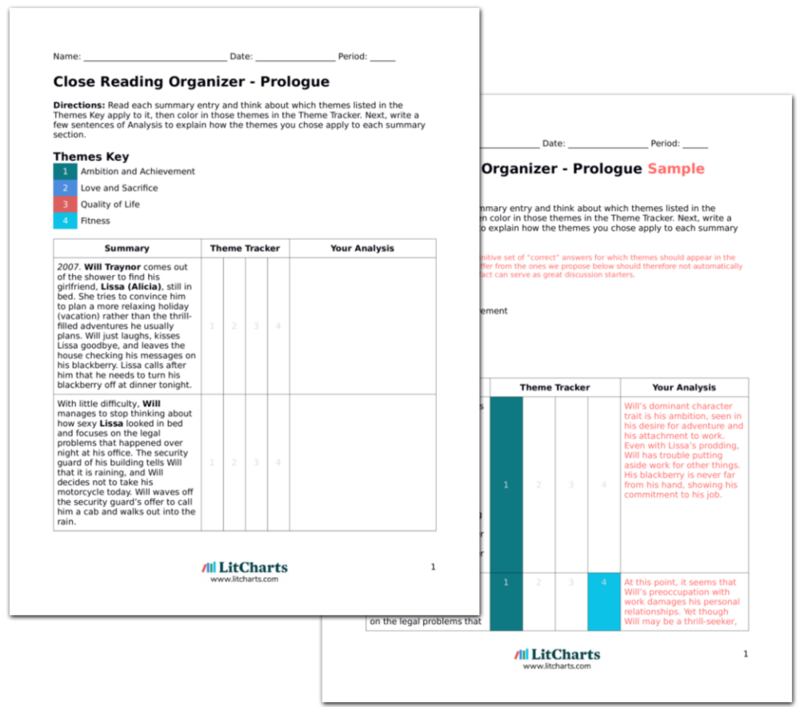 LitCharts assigns a color and icon to each theme in Me Before You, which you can use to track the themes throughout the work. Lou has been caring for Will for a month, and her parents love the inside peek she provides to the Traynor’s upper class life. Josie is happy to find out that the Clark house is just as clean as the Traynor house. Bernard finally respects Lou as a wage-earner in the family, while Patrick and Treena treat Lou exactly the same. Lou can’t get a read on how the Traynors think of her. Will, Mr. Traynor and Nathan are polite but distant, while Camilla is now convinced that Lou is worse than useless at any domestic task. Josie seemingly cleans her house as a way to prove to herself that the Clark life is just as good as the Traynors’ life, in spite of their class differences. Yet Camilla still clearly thinks of Lou as inferior because she is poor. Lou has learned to receive love through teasing even though her family is starting to appreciate her as an adult with her own ambitions. Lou tries her best to stay cheerful and upbeat, like Camilla hired her to be, but can’t stand the way that Camilla micromanages her every move. Yet finally, Lou has a breakthrough. Will catches Lou trying to sneak vegetables into his meal, but he jokes about it instead of getting mad. Nathan tells Lou that he has never seen Will in a better mood. Lou realizes that Will likes it when Lou is rude to him, because everyone has treated him too delicately since his accident. Lou can’t handle Camilla’s micromanaging, as she wants to make decisions for herself. Moyes suggests that the ability to make one’s own decisions is very important, underscored by Will’s distaste for being treated like a child who needs veggies sneakily fed to him. Lou and Will start to get along better because Lou treats him as an adult who is capable of fighting with someone. Will asks Lou to keep him company while he watches a DVD in the afternoon. Lou declines, as she says she doesn’t like foreign films with subtitles. Will insists that Lou broaden her horizons and watch a French movie. Lou is skeptical, but is brought to tears by the end of the movie. Will sarcastically comments that she must not have liked it at all, then asks Lou what she does in her spare time. Lou responds that she likes clothes, but that she doesn’t really have any hobbies. Will is appalled, and even moreso when Lou mentions that she has only ever traveled to Spain. Will finally asks point blank what Lou wants to do with her life, but Lou only says she doesn’t know. Lou’s world has gotten a little larger through just watching a film. Lou sees foreign films as a cultured pastime that is not for people of her class and upbringing. Will wants Lou to experience more from life than Lou has ever considered for herself. Lou still cannot think of any ambitions for herself, but she is starting to realize that she does want more from her life. On Friday, Lou drives Will to a doctor’s appointment. She is happy to get out of the house, but quickly becomes terrified at all the logistics necessary to get Will out safely. Will jokes about his wheelchair to put Lou at ease, and Lou gets them all to the hospital despite all her fears about the car. Nathan gets Will out of the car and into the hospital as Lou marvels about the accessibility problems she never considered before. Will’s world is very small now, and not entirely by his choice. The physical limitations of Will’s wheelchair make it hard for him to even consider leaving his house, much less living out the kind of adventures he had before the accident. Something as simple as a doctor’s appointment is a large ordeal. 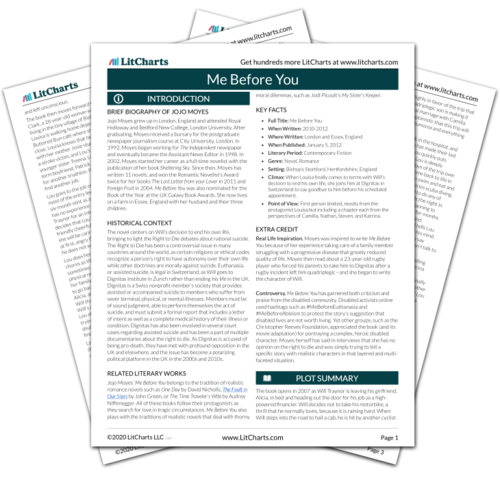 Get the entire Me Before You LitChart as a printable PDF. While Will meets with the doctors, Lou and Nathan wait outside. Lou asks if the doctors are checking whether Will is getting better, but Nathan tells her that Will’s spinal injury made him a C5-6 quadriplegic with no hope for recovery. Lou goes to get coffee to pass the time and then knocks on the door when she returns. The doctor calls for her to come in as Nathan hurriedly pulls at Will’s sleeves. He is not fast enough to hide the livid red scars on Will’s wrists. Lou finds out that Will is not only severely limited at the moment, but he also has no hope of his physical health ever improving. This lack of hope actually caused Will to attempt suicide, as Lou guesses from the scars on Will’s wrists—and now, perhaps, it becomes more clear why Lou is supposed to never let Will be by himself for too long. Mueller, Bethany. "Me Before You Chapter 5." LitCharts. LitCharts LLC, 9 Feb 2017. Web. 19 Apr 2019. Mueller, Bethany. "Me Before You Chapter 5." LitCharts LLC, February 9, 2017. 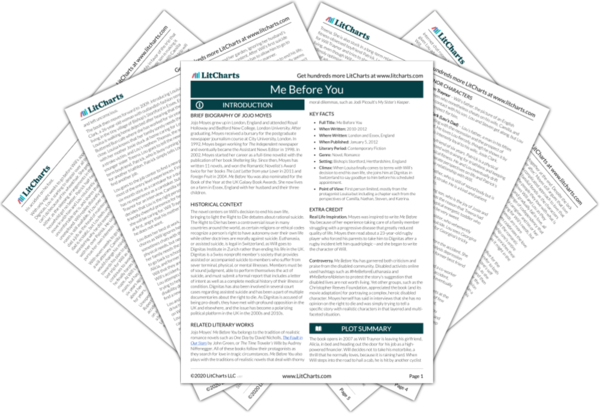 Retrieved April 19, 2019. https://www.litcharts.com/lit/me-before-you/chapter-5.